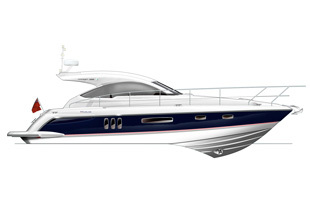 Princess are going to be back in the sub 40-foot market with the new V39 sportscruiser. The boat, which doesn’t have a launch date yet, will have two cabins and a single bathroom down below and twin Volvo Penta D6 330hp engines providing the grunt. The hardtop will be a canvas affair and there will be no option to have an ‘open’ version of the boat. The master cabin in the bow will be ensuite to the bathroom whilst the midships cabin will have sliding single berths so that they can quickly be transformed in to a double. Most time will be spent in the cockpit and Princess promise plenty of seating and a wet-bar for entertaining guests. They also boast plenty of storage in the cockpit as well as room on the bathing platform for a decent tender. When it arrives the V39 will start from £282,000 inc UK VAT and more details including layouts, interior renderings and specifications will be available at September’s PSP Southampton International Boat Show. The announcement comes just after Fairline released images of their hardtop version of the Targa 38, the Targa 38 Gran Tursimo (pictured below). The boat will be launched at this year’s PSP Southampton International Boat Show and provide some some stiff competition for the V39. If the rumours that Sunseeker are also working on a similar type of boat come to fruition then it really is an exciting time to be in the market for a sub 40-foot sportscruiser.